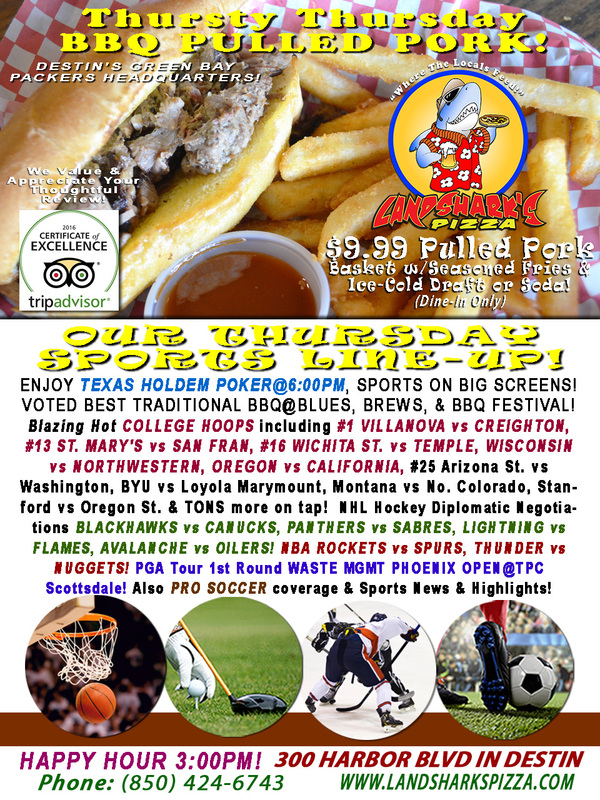 / Best Hot Wings in Destin FL / It’s WINGSDAY at Landshark’s WINGS ONLY 69¢ EACH|BAMA, LSU, #2 VIRGINIA Hoops & More! All Bourbons $2 OFF! 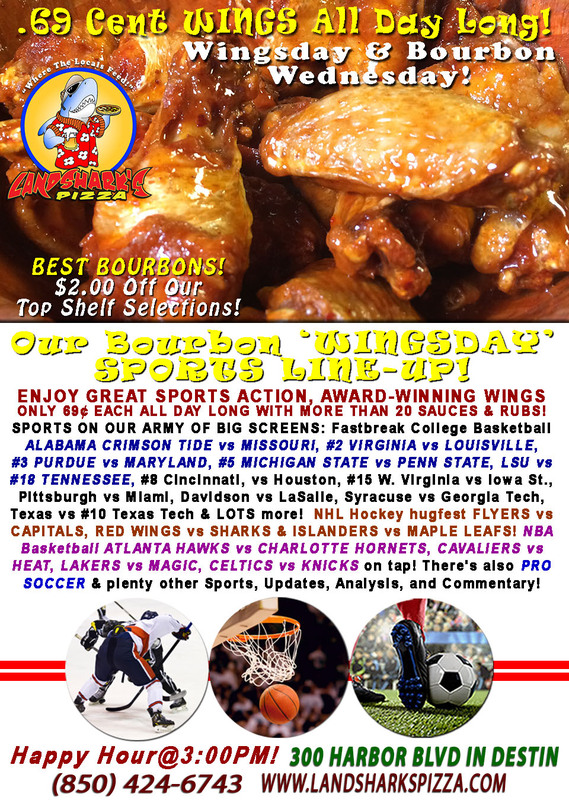 It’s WINGSDAY at Landshark’s WINGS ONLY 69¢ EACH|BAMA, LSU, #2 VIRGINIA Hoops & More! 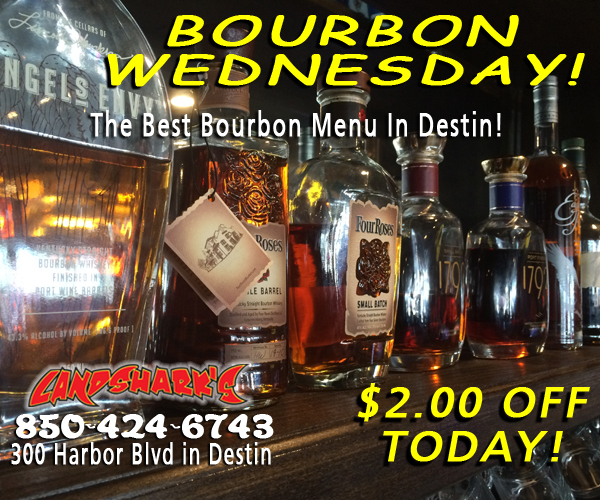 All Bourbons $2 OFF! Alabama Crimson Tide leads a blazing-hot College Basketball line-up on Wingsday in Destin at Landshark’s Pizza Company! 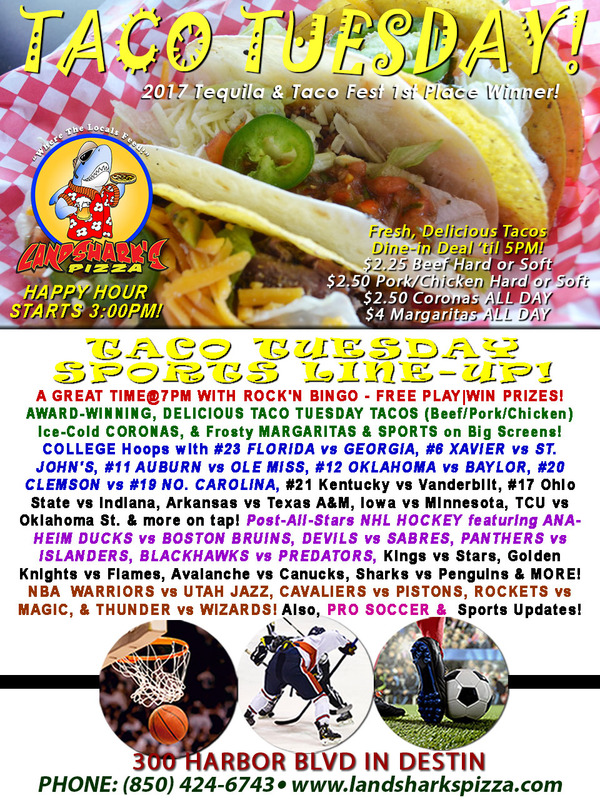 That along with NHL, NBA & more at Landshark’s Pizza Company in Destin, Florida featuring Wing Wednesday Specials! We’re not trying to brag, but Humpday’s been losing it’s reputation for sucking so much thanks to our juicy & delicious Award-Winning wings for only 69¢ each ALL DAY LONG! Choose from among more than 20 sauces and rubs to compliment! SPORTS ON OUR ARMY OF BIG SCREENS – Fastbreak NCAA HOOPS: ALABAMA vs MISSOURI, #2 VIRGINIA vs LOUISVILLE, #3 PURDUE vs MARYLAND, #5 MICHIGAN STATE vs PENN STATE, LSU vs #18 TENNESSEE, #8 Cincinnati, vs Houston, #15 W. Virginia vs Iowa St., Pittsburgh vs Miami, Davidson vs LaSalle, Syracuse vs Georgia Tech, Texas vs #10 Texas Tech & LOTS more! NHL Hugfest FLYERS vs CAPITALS, RED WINGS vs SHARKS & ISLANDERS vs MAPLE LEAFS! NBA Basketball ATLANTA HAWKS vs CHARLOTTE HORNETS, CAVALIERS vs HEAT, LAKERS vs MAGIC, CELTICS vs KNICKS, Mavericks vs Suns, Bulls vs Trailblazers, 76ers vs Nets on tap! There’s also PRO SOCCER coverage plus plenty other Sports Broadcasts, Sporting News, Analysis, and Commentary! Previous Post: « Landshark’s TACO TUESDAY AUBURN vs OLE MISS! TACOS, MARGARITAS & CORONA SpecialS & ROCK’N BINGO at 7PM!